The Honda CR-V has always been a viable choice in the crossover SUV class, but after a major redesign for the 2017 model year, the CR-V is more impressive than ever before. The 2017 CR-V offers a modernized dashboard, an enhanced instrument cluster, an updated touchscreen and more legroom than past model years. The 2017 Honda CR-V comes in four trim levels: LX, EX, EX-L and Touring. All trims a generous amount of interior space, a long list of standard safety features, a comfortable and quiet cabin, a driver-oriented handling and a large cargo capacity. Ready to learn more about the 2017 CR-V? 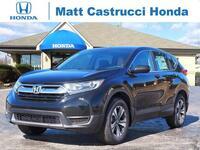 Read on for details on features and specs you can find on this great crossover! 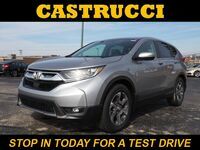 The 2017 Honda CR-V comes with two engine options: a 2.4-liter inline 4-cylinder that generates 184 horsepower and 180 pound-feet of torque and a 1.5-liter single-scroll turbocharged engine that makes 190 horsepower and 179 pound-feet of torque. The 2017 Honda CR-V comes available with a variety of advanced safety features designed to keep drivers and passengers as safe as possible, such as the Lane Keeping Assist System, Adaptive Cruise Control, the Collision Mitigation Braking System and the Road Departure Mitigation System. Advanced technology features are not in short supply on the 2017 Honda CR-V. The crossover has available premium technology features like LED headlights, a Multi-Angle Rearview Camera, smart entry, rain-sensing windshield wipers, and the Honda Satellite-Linked Navigation System™. Want to learn more about this great crossover? 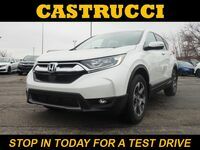 Give us a call at Matt Castrucci Honda and we’ll fill you in on everything you need to know about the 2017 CR-V. 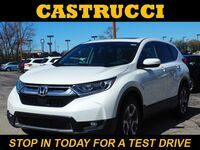 Drivers interested in meeting the 2017 Honda CR-V in person are encouraged to schedule an obligation-free test drive online today! 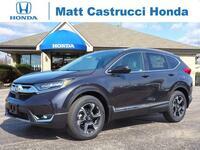 Interested in a 2017 Honda CR-V?